Mrs. Clark’s Food is a food processing company which is engaged in the manufacture of sauces, salad dressings and juices under its own brand. Aside from its retail products, the company also produces private-label products for supply to different foodservice companies. Mrs. Clark’s Food was founded in 1926 by the Clark Family. The inspiration for the business was Mary Clark’s salad dressings, which were widely popular owing to their delicious taste. The Clark family ran the company for almost 50 years, manufacturing mayonnaise, salad dressings and sauces until it became a product known throughout all of Iowa. In 1973, Mrs. Clark’s Food was sold to a group of Chicago Investors. Despite the new management, the company remained headquartered in Iowa and began to produce private-label salad dressings for supply to wholesalers and local foodservice establishments. The company’s new business strategy, accompanied by the continuous manufacture and distribution of its products under its own brand, made it possible to achieve a major sales growth after only a couple of years. After 10 years, the company decided to expand its product line by adding a variety of fruit juices. At the end of the 1980s, Mrs. Clark’s Foods was already bringing in good profits and was also operating at maximum capacity. In the same decade, the company finished and started to operate a new facility that contained state-of-the-art machinery for producing their food products. The 1990s was a period of stiff competition for Mrs. Clark’s beverage private-label products. To diversify its scope of business, it began creating sauces made from tomatoes. The company continued to strive despite its competitors because it continued to focus in retail, as well as in the industry of food service, co-packing and commodities. In 1995, AGRI Industries was able to acquire Mrs. Clark’s Foods. After the company was purchased, it underwent some restructuring and then was streamlined by its new management. By 2003, Mrs. Clark’s Food was able to acquire Alljuice Food and Beverage Corporation and in 2008, the company officially became a Choose Iowa™ producer. 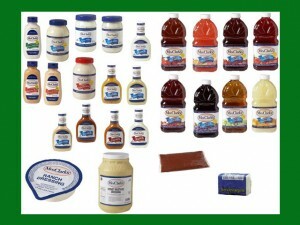 Currently, Mrs. Clark’s Foods remains to be a leader in the co-packing and private-label producers in Midwest America when it comes to retail dressings and juices. Its own retail brands are still currently being sold in different groceries and retail stores nationwide. We are out in CA for the winter and i cannot find your salad dressing anywhere. Do you sell it out here? Where can I purchase your tomoato juice in eastern Iowa? I have been using Mrs. Clarks tomato juice for some time now and I find it at Menards here in town. But when I go there to get more I find many times there is none or only a bottle or two and I would like to buy at least 6 bottles at a time because one bottle only lasts me 3 or 4 days. I like the taste better than any of the other canned tomato juices in the stores. Would I be able to buy Mrs. Clarks tomato juice in bulk from somewhere? I like the size of the bottles, and I don’t have to put it in another type of container like I do if I buy tomato juice in cans. Do you ship to any other stores in Manitowoc, Wisconsin besides the Menards stores? They told me they only get about 8 bottles in at a time and by the time I get there, there are never very many left. I purchased a bottle of Mrs. Clark’s Tomato Juice the other day. When I got it home and went to open it up I found that the seal on the cap was broken and the juice was not any good. Can you send me a coupon for a new bottle? I would greatly appreciate it. The UPC coe is 70034 20163. I could not find a best buy date on the bottle.